Laser combat mini RC Helicopter features proportional control, altitude & rotor speed control, flight stabilizing system, & durable plastic body. Order today and get 2 helicopters in the box. Plus 1 spare rear propeller and blades for each of the helicopters. 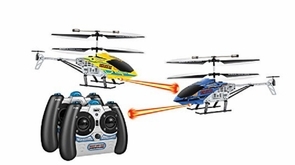 Flies for about 10-15 minutes and 3 separate frequencies are available for awesome RC helicopter fun. These are the perfect helicopters that will fire lasers at your command. Fly forward, backward, left, right and hover. With these two helicopters, you can take to the skies and battle it out to determine who's superior pilot. When hit with the laser, the helicopter will drop in the air a bit, but will not crash. The charging jack allows for quick recharging and extended flying time of about 10-15 minutes per charge. These RC helicopter measures about 10" long and comes fully assembled and ready to fly right out of box. Insert 6 AA batteries in the controller and give the helicopter a quick charge from the included charger. It's great for indoor flights. Full function 3 channel control lets you fly forwards, backwards, left, right, and hover too with ease. Now everyone can fly like a pro in just minutes. Great helicopter. The kids love it. Much thanks.